Content: Goo's portable charger makes car journeys and using your smartphone while on the move or when travelling easy. This range of power banks boasts a whole host of advantages. Our 4,000 and 6,000 mAh power banks charge your phone really quickly, several times in a row, without having to be plugged into the mains. Our backup charger for wireless charging mobiles is a real charging station. Place your smartphone on the stand, and it charges automatically. If your phone is not designed to charge in this way, you can connect it via the USB port. 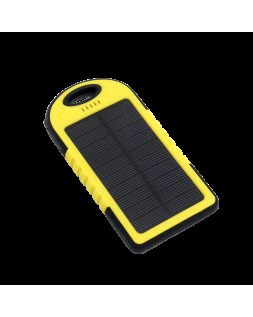 This high-tech portable charger is also available as a solar power bank, which is water resistant and recharges using daylight. It withstands a wide temperature range of between -20 and 60°C. The Goo smart travel kit, found in our high-tech gadget section, contains a 300 mAh power bank and a mini Bluetooth speaker with three to four hours playtime.